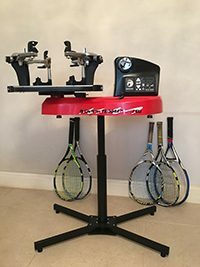 I run a racket restringing service at Westcliff Hardcourt Tennis Club. My service covers Westcliff-on-sea, Leigh-on-sea, Southend-on-sea and the surrounding areas and is available to both club members and non-members alike. I have restrung thousands of tennis rackets during my career an am a competent stringer. I ran a business importing and distributing tennis strings for over 10 years so know a lot about tennis strings and how different strings play. All the restrings I do are carried out using a state of the art Gamma electronic stringing machine, which can tension a racket to the nearest ⅒ of a pound. Rackets can be turned around in 24 hours on request. Contact me on 07948 726309 or [email protected] to have your racket restrung by me.